Carryings On Up The Dale: A day out in deepest Derbyshire with the Like a Stone Wall Wargames Group. A day out in deepest Derbyshire with the Like a Stone Wall Wargames Group. 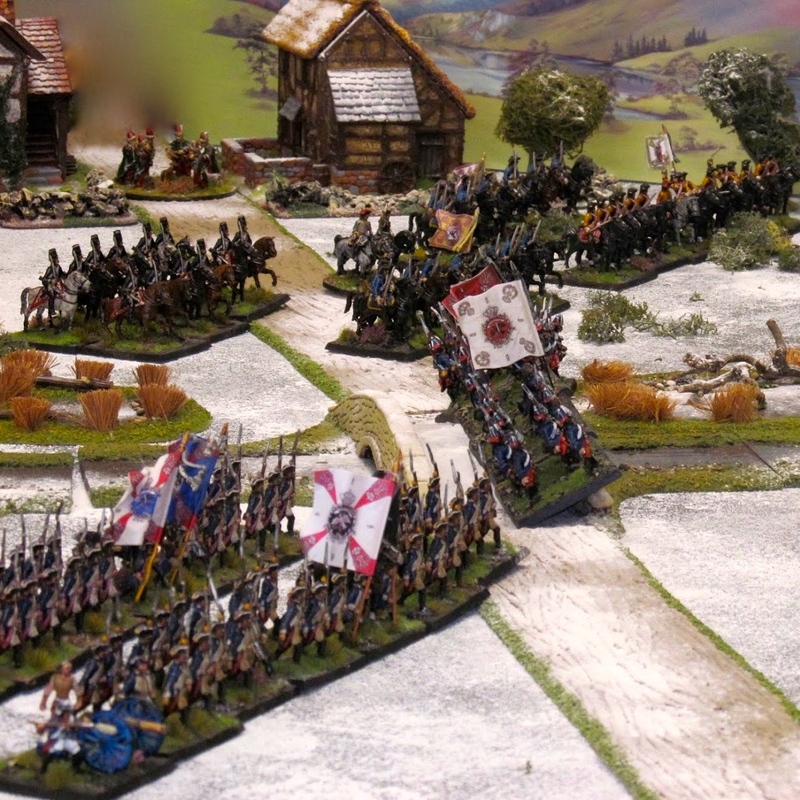 A while ago I was invited by Tim and Barry of the Like a Stone Wall Wargames Group to take part in a big refight of the Battle of Gadebusch between the Swedes and a Danish/Saxon army during the Great Northern War in 1712. 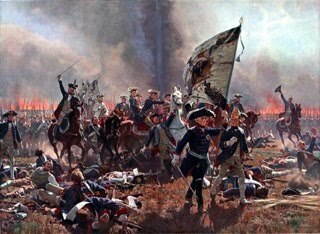 It was Sweden’s last great victory in this war, and was fought I believe to prevent the loss of the city of Stralsund to the Danes. We were using Tim’s own set of rules “The Wild Geese” which I’d never used before but had been sent a copy a few months ago to peruse. We went down the day before and stayed at a nearby hotel ( using some saved up loyalty points to good effect) as the start time for the game was 08:30 for a 09:00 kick off. 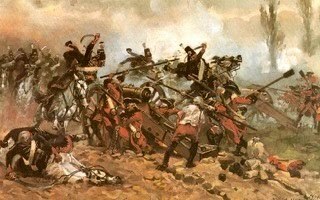 In addition to the lads from the LaSW group and myself, they’d invited Nick Wragg, the proprietor of Ebor Miniatures in York.The village hall in the little village of Pentrich had been hired for the day. As an aside, Pentrich was the centre of the last so-called revolution in Great Britain in 1817, when 200 - 300 or so disgruntled and lightly armed labourers from a variety of trades ( iron workers, quarrymen and stockingers) marched on Nottingham with some rather vague objectives. They were betrayed by a government spy in their ranks and two of the ringleaders (including a grandly named Jeremiah Brandreth) were found guilty of treason and sentenced to be hung, drawn and quartered. The Prince Regent remitted the drawing bit, so they were just hung and beheaded which was unlikely to have been much consolation. They were the last public executions to be held in Derby. Back to the game. Actually two games as the first one reached a conclusion around lunchtime so we reset the table and swapped sides. In game one I took the Danish right, made up of ultimately ten regiments of Danish and dodgy Saxon horse and dragoons (assuming the Saxons arrived of course.....). 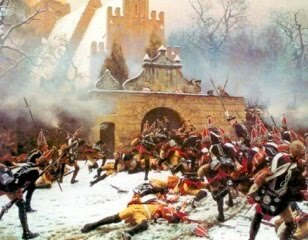 After a shaky start when my Danish Lifeguard were pounded into next week by Swedish cannon, our cavalry closed, albeit slowly as we were both crossing a frozen marsh. 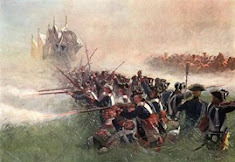 Mixed fortunes but eventually, and with some help from the Saxons, the Swedes were driven off in full retreat. 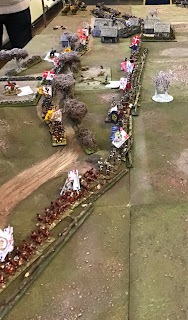 This was helped undoubtedly by the death of the Swedish cavalry commander in about turn 3 or 4 which left his entire brigade out of command for several turns until a lucky dice roll resulted in a suitable volunteer being found to take the late commander’s place. Sadly by then the Danish left flank had long since run away and the centre was crumbling. 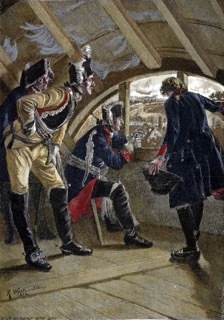 I had taken grievous losses in seeing off the Swedes and our army break point had been reached. End of game. Swedish victory, but glory to the Danes on the right. Hurrah! As it was only just after lunch Tim suggested resetting the game and swapping sides. This second game appeared to be going well for the Swedes on the left (my command) as my bonkers, er, aggressive cavalry had broken a large regiment of Danish horse and had pursued right into the oncoming Saxons almost on the tables edge. It looked like the Swedish centre might have been struggling and the noises from the other flank suggested that the Danes might have been doing better than in previous iterations of the game (i.e. they'd survived more than a couple of turns). Sadly I had to leave at 3pm so don't know the final outcome of the second game but I suspect it would have been a Swedish win. I thoroughly enjoyed the day with excellent and the very welcoming company of a canny group of gamers cast from the same mould as me in terms of wargaming ethos, e.g. big/grand games, play the period not the rules, enjoying the spectacle and the social occasion that is each game. I also must say that the rules are really good. I picked them up very quickly. They were fast moving, well thought out and I look forward to using them again. Thanks for the invitation, the warm welcome and the hospitality, (and Barry's missus for the sandwiches). I look forward to meeting up again, next time perhaps in The Burrow. Good to see you getting about Colin! Great looking games but what a shame you had to leave on the point of Swedish victory in game two!